The first and most important activity is good grazing management. Specifically, keep animals from overgrazing. Overgrazing in the fall could ruin next years forage production. It is more critical now than any other time of the year. Overgrazing is not caused by having too many animals in a field. It occurs when you keep animals in a field too long or bring the animals back before the forages have recovered. The length of time is determined by plant growth. The animals should be removed before plants they initially grazed start to re-grow. Overgrazing can be avoided by paying attention to forage residual, grazing time and rest. You should leave at least 1200-1500 lbs. of DM per acre or 2-3″ of green forage when you pull animals from a field. You should remove the animals before the forage starts to re-grow. The pasture should recover to above 2400 lbs. of DM acre or 6-8″ before turning the animals into a field. Fall is a critical time for our cool season perennial forages. In the cooler temperatures leaf growth is slower while photosynthesis does not slow down. This increases the reserve carbohydrates in the plant. Cool season forages in the fall store reserve carbohydrates and use them to develop new tillers and roots. Carbohydrate storage, new tiller, and root development can only happen if there is enough leaf area for photosynthesis. These three things are accomplished with little additional leaf growth. Making management decisions that negatively impact this development will hurt survival over winter and growth next year. You can help your pastures by fertilizing. If you only fertilize your pastures once a year you should be do it in the fall. You have a fairly large window to accomplish this, the months of September through November. Fall is an excellent time to apply fertilizer to our pastures. Fall is the time when most of our forage plants are growing roots, developing tillers and storing energy for winter. Proper soil pH and adequate soil nutrients will enhance forage competitiveness. Take a soil test and follow the recommendations. Nitrogen can be applied in fall. Late fall applications of nitrogen, from October through November, will increase grass tillering, root growth, and energy storage. This will help with spring green-up and improve competition against weeds. Apply after grass growth has slowed, but before the plant has gone dormant. Use a low rate of 30-40 lbs. of N per acre. A pasture with good grazing management and with good soil fertility should out-compete weeds. This is the main reason I don’t spend a lot of time talking weed control. Occasionally we still have problems. For some of our biennial and perennial weeds fall can be an excellent time to apply herbicide. A few weeds that come to mind include: Wild Turnip/Birdsrape Mustard, Canada thistle, Wild Carrot, and Poison Hemlock. A few cautions, all of the broadleaf herbicides that can be used will also remove the legumes and there can be grazing restrictions depending on the herbicide and type of livestock. Check the 2008 Weed Control Guide or call your local Extension Office for specific recommendations. Legume removal is the other reason I don’t usually mention herbicides. Legumes in pastures are desirable. Having 30-40% clover, on a dry weight basis, in your pastures will help reduce you nitrogen needs, fill in growth during summer, and provide a higher quality feed for your livestock. How can we avoid over grazing when we are running out of growing pasture? If you are dealing with ewes after weaning then have you considered feeding your poorer quality hay? 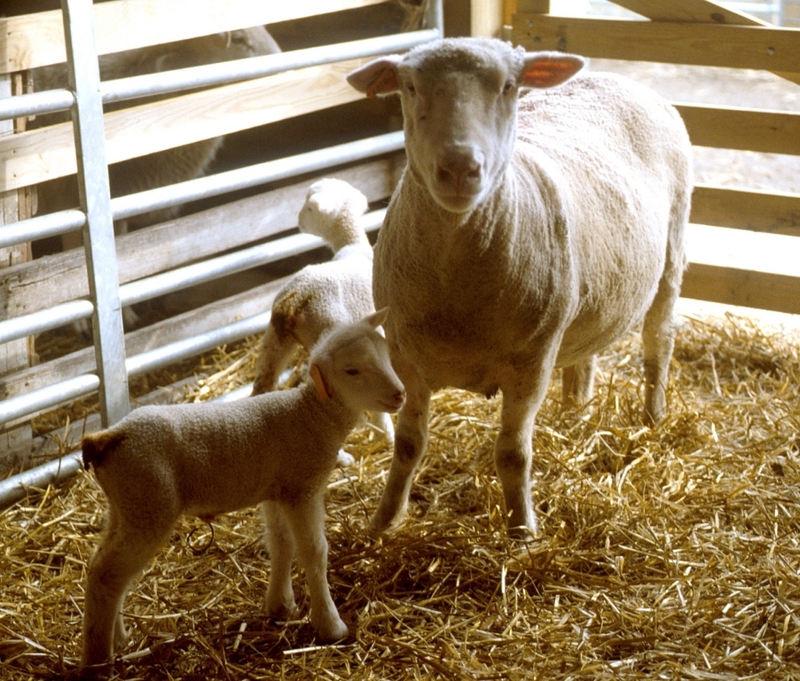 After weaning, a mature ewe’s nutritional need is the lowest it will be in the production cycle. Because of the rainy spring most of the first cutting hay is not that good. This may be the only time during the year when the poor quality hay that was made in June could meet the ewe’s nutritional needs. Another option is grazing corn residue. Corn harvest can provide an opportunity for additional feed that can be grazed. The residue that is left in the field is not a bad feed for about 60 days after harvest. Posted by Braden Campbell at 9:01am January 4, 2019 Posted in Forages and Pasture and tagged Forages and Pasture, Nutrition. Bookmark the permalink.